Respiration is crucial to life and in all organisms this is performed by a series of protein complexes located in the mitochondrial inner membrane, cholorplast thylakoid membrane or plasma membrane of bacteria or archaea (1). These respiratory complexes make up the so-called electron transport chain (ETC) and transfer protons across a biological membrane, which is coupled to the shuttling of electrons. The simultaneous transfer of protons and electrons generates an electrochemical proton gradient (proton motive force) which fuels the synthesis of ATP from ADP and inorganic phosphate. In mitochondria, the ETC comprises four protein complexes, termed complex I, III, IV and V. Of these, complex I is the entry point of electrons into the ETC and together with complex III and IV functions as proton translocating enzyme to generate the proton motive force (PMF). While complex V (ATP synthase) utilizes the energy of the PMF for the production of ATP (REF). The basic architecture of the mitochondrial ETC is shown in figure 1 (adopted from 1). Interestingly, accumulating evidence suggests that respiratory complexes are organized into large super complexes, termed the respirasome (2). Despite the wealth of structural data on respiratory complexes and individual subunits thereof, the precise molecular composition of the respirasome remained elusive. 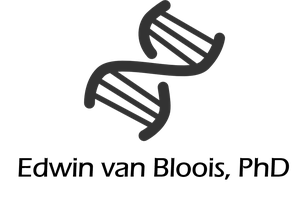 However, recent studies, employing cryo-electron microscopy, assessed the structure of different mammalian respirasomes, including the human (3,4,5,6). These studies revealed different respirasome stoichiometries, namely CI2CIII2CIV2 for the human super complex and CICIII2CIV for the sheep, porcine and bovine respirasome. In contrast to the mitochondrial ETC, the (aerobic) respiratory system of E. coli is more complex as it is made up of three dehydrogenases, two NADH dehydrogenases, three ubiquinol oxidases and two bo3-type cytochromes (7). Different respiratory supercomplexes have been observed in bacteria. For example, a complex of both NADH dehydrogenases, a large assembly of formate dehydrogenase and cytochrome bo3 as well as a large complex containing at least both NADH dehydrogenases and other respiratory enzymes have been reported for E. coli (8,9). ATP synthase (complex V) is a highly conserved enzyme and a crucial part of the ETC. In fact, it is the primary means of energy production in most organisms because it is responsible for synthesis of the vast majority of cellular ATP by coupling the transport of protons across a biological membrane to the formation of a high-energy phosphate bond in ATP (10). Moreover, ATP synthase represents an attractive target for anticancer and antimicrobial drugs (11). Here, I will discuss recent structural and mechanistic advances of ATP synthase from E. coli. ATP synthase is a membrane-embedded enzyme that is ubiquitously present in all organisms. As a primary source of cellular ATP, it is essential for the functioning of a cell. The enzyme functions as a transporter and couples the movement of protons across the membrane to the production of ATP. All ATP synthases share a similar structure and exhibit the same biochemical and mechanistic properties (12,13). The enzyme is monomeric in photosynthetic organisms, while a dimer has been observed in the mammalian mitochondrial inner membrane. A schematic representation of E. coli ATP synthase is shown in figure 2 (adapted from 14). Like all ATP synthases, it comprises two parts, namely the membrane-integrated Fo sector and the cytosolic F1 sector. Consequently, this enzyme is termed FoF1 or F-ATP synthase. E. coli ATP synthase has a molecular mass of about 530 kDa and is made up eight different subunits. The Fo part is organized into a ring-shaped structure and comprises the proton-conducting channel. It is believed that the interior of the c ring is filled with lipids. The Fo sector contains a, b and c subunits in the stoichiometry 1, 2 and 10 (ab2­cc10). The number of c subunits in the Fo sector is variable e.g. it numbers 8 in the ATP synthase of bovine mitochondria, 10 in the enzyme from yeast mitochondria and 14 in chloroplasts. In bacteria, the number of c subunits varies from 10 to 11 (REF). The c-subunit is highly hydrophobic, has a molecular mass of about 8 kDa and comprises a hairpin of two transmembrane domains. The a-subunit consists of 5 transmembrane domains and is crucial for the translocation of protons because it forms the actual pathway for the transfer of protons in single file across the membrane. The F1 sector represents the business part of the enzyme because it is responsible for the synthesis of ATP (12,13). It is made up of α, ß, δ, ε and γ subunits in the stoichiometry 3,3,1,1 and 1 (α3ß3 γ δ ε). Despite the overall structural similarity, ATP synthases display some variation in subunit composition. For example, the E. coli enzyme contains the ε subunit which is not present in bovine ATP synthase. Interestingly, the ε subunit is able to inhibit bacterial and chloroplast ATP synthases (12). The membrane-embedded and cytosolic sector are connected through a peripheral stalk consisting of two b subunits. The α and ß-subunits are alternately arranged into hexagon and contain six nucleotide-binding sites. All α-subunits are able to bind ATP but do not play a role in catalysis unlike the ß-subunits, which contain three nucleotide-binding sites that are catalytically active. These sites are termed ßTP, ßDP and ßE and are able to bind ATP, ADP and Pi. During catalysis, ßTP, ßDP and ßE undergo conformational changes that enables the following sequence of events: binding of substrates (ADP and Pi), ATP synthesis and release of ATP (12,13). These conformational changes are linked to rotation of the γ-subunit. This subunit extends into the α3ß3 of the F1 sector and its rotation is powered by the rotation of the c subunits of the Fo sector upon proton translocation. Thus, in the holo enzyme the Fo sector and F1 sector operate against each other (opposite rotational movements). The net function of the enzyme is PMF-dependent e.g. in case of a strong PMF ATP is produced and when the PMF is weak ATP is hydrolyzed and protons are translocated across the membrane to generate a PMF (12,13). The following video nicely shows the principles of rotational catalysis. 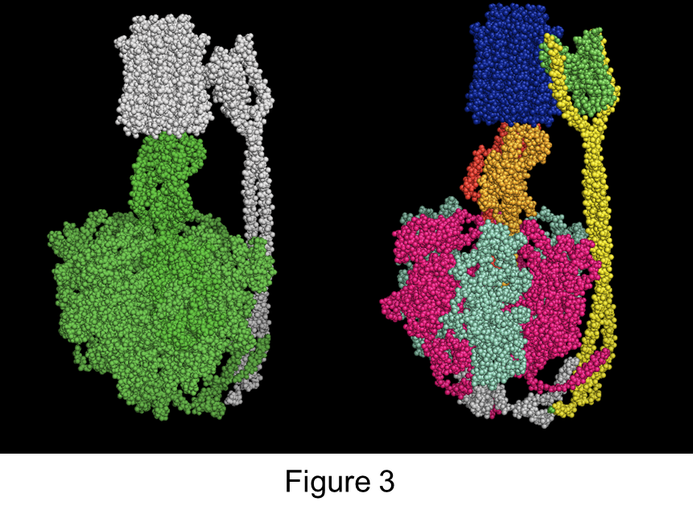 Several high resolution structures of ATP synthases from different organisms have been solved, including bovine mitochondrial ATP synthase and the yeast mitochondrial enzyme. Recently, a cryo-EM reconstruction of E. coli ATP synthase was reported (14). A complete molecular model of this reconstruction is depicted in figure 3 as spheres, revealing an overall structure typical of ATP synthases with a proton-powered Fo sector attached to a catalytic F1 sector with a central and peripheral stalk. The left panel shows both sectors of the enzyme. The membrane-embedded Fo part is in grey, while the cytosolic F1 sector is in green. The right panel reveals the subunit composition of both sectors. The c-subunit of the Fo sector is in blue, the a-subunit in green and the b-subunit is in yellow. While the α-subunit (in the ATP-bound state) of the F1 sector is in pink, the ß-subunit is in light blue, the γ-subunit in orange, the ε-subunit in red and the δ-subunit in grey. The central stalk is formed by the γ and ε-subunits and the peripheral stalk is made up of two b-subunits. ATP synthases represent a class of membrane-bound enzymes dedicated to the synthesis or hydrolysis of ATP (ATPase). Depending on the cellular localization and function, these are designated as F-, V-, A-, P-, or E-type ATP synthase. F-ATP synthases are located in the inner membrane of mitochondria, thylakoid membrane of choloropasts and the bacterial plasma membrane. These enzymes catalyze the synthesis of ATP. 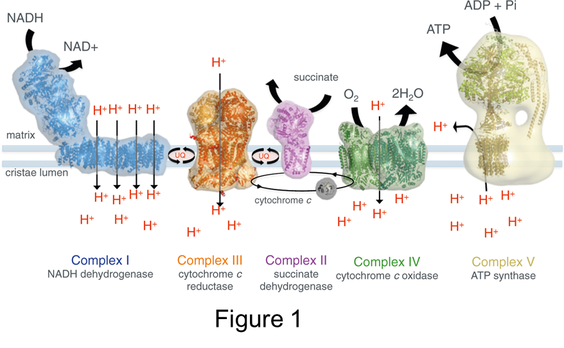 V-type ATPases are found in eukaryotic organelles of the endomembrane system and hydrolyze ATP to drive the transfer of protons but they are unable to synthesize ATP. A-ATP synthases are exclusively found in the plasma membrane of archaea and have a similar role as F-ATP synthases. P-ATPases hydrolyze ATP to drive the membrane translocation of ions, phospholipids as well as other compounds. These enzymes are located in the bacterial plasma membrane and the membranes of eukaryotic organelles. E-ATPases are localized at the cellular surface and hydrolyze a variety of nucleotides (11). F-ATP synthase is essential for cell viability because it is the primary enzyme responsible for the synthesis of cellular ATP. As part of the ETC, this enzyme couples the translocation of protons across the membrane to formation of ATP out of ADP and Pi. The wealth of structural information available for ATP synthases from different organisms reveals a conserved catalytic mechanism and a similar overall structure (REFs). This comprises a membrane embedded Fo­ sector that functions as a proton-conducting channel and a extramembranous catalytic F1 sector. With regards to its key biological function, it is not surprising that dysfunction of ATP synthase is linked to various devastating human diseases, including Alzheimers, lysosomal storage disease and different neuropathologies. Moreover, F-ATP synthases have emerged as an attractive target for anticancer and antimicrobial drugs (11). It expected that the novel molecular model of E.coli F-ATP synthase (14) will result in novel leads for antibacterial drugs and further molecular and mechanistic understanding of these enzymes. 1. Kühlbrandt, W. 2015. Structure and function of mitochondrial membrane protein complexes. BMC Biol: 13:89. 2. Enríquez, JA. 2016. Supramolecular Organization of Respiratory Complexes. Annu Rev Physiol. 78: 533-561. 3. Gu, J., Wu, M., Guo, R., Yan, K., Lei, J., Gao, N., Yang, M. 2016. The architecture of the mammalian respirasome. Nature 537: 639-643. 5. Sousa, J.S., Mills, D.J., Vonck, J., Kuhlbrandt, W. 2016. Functional asymmetry and electron flow in the bovine respirasome. Elife 5. 6. Guo, R., Zong, S., Wu, M., Gu, J., Yang, M. 2017. Architecture of Human Mitochondrial Respiratory Megacomplex I2III2IV2. Cell 170: 1247-1257. 7. Unden, G., Dünnwald, P. 2008. The Aerobic and Anaerobic Respiratory Chain of Escherichia coli and Salmonella enterica: Enzymes and Energetics. EcoSal Plus. doi: 10.1128/ecosalplus.3.2.2. 8. Sousa, PM., Videira, MA., Bohn, A., Hood, BL., Conrads, TP., Goulao, LF., Melo, AM. 2012. The aerobic respiratory chain of Escherichia coli: from genes to supercomplexes. Microbiology. 158: 2408-2418. 9. Sousa, P. M. F., Silva, S. T., Hood, B. L., Charro, N., Carita, J. N., Vaz, F., Penque, D., Conrads, T. P. Melo, A. M. P. 2011. Supramolecular organizations in the aerobic respiratory chain of Escherichia coli. Biochimie 93: 418–425. 10. Nakanishi-Matsui, M., Sekiya, M., Futai, M. 2016. 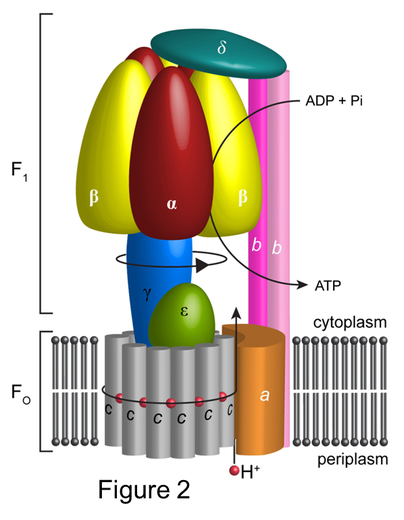 ATP synthase from Escherichia coli: Mechanism of rotational catalysis, and inhibition with the ε subunit and phytopolyphenols. Biochim Biophys Acta. 1857: 129-140. 11. Ahmad, Z., Okafor, F., Azim, S., Laughlin, TF. 2013. ATP synthase: a molecular therapeutic drug target for antimicrobial and antitumor peptides. Curr Med Chem. 20: 1956-1973. 12. Nakanishi-Matsui, M., Sekiya, M., Futai, M. 2016. ATP synthase from Escherichia coli: Mechanism of rotational catalysis, and inhibition with the ε subunit and phytopolyphenols. Biochim Biophys Acta. 1857: 129-140. 13. Mukherjee, S., Warshel, A. 2017. The FOF1 ATP synthase: from atomistic three-dimensional structure to the rotary-chemical function. Photosynth Res. doi: 10.1007/s11120-017-0411-x. 14. Sobti, M., Smits, C., Wong, AS., Ishmukhametov, R., Stock, D., Sandin, S., Stewart, AG. 2016. Cryo-EM structures of the autoinhibited E. coli ATP synthase in three rotational states. Elife. 5. doi:10.7554/eLife.21598.